This next section of the head is a little tricky. See VIDEO for visual explanation. When you begin row 10, you will want to make sure you are starting at the right side of Olaf’s body as Olaf is facing you. (See Diagram and/or video). For this reason, you will want to wait to place your embellishments to make sure your face is positioned correctly. Sew on CARROT NOSE. (See CARROT NOSE pattern below.) Stuff. Weave around front loop of ea stitch for clean FO. This will also keep the top of your Olaf head a bit rounder. Decide placement on either side of Olaf’s UPPER BODY SEGMENT. Insert your hook into the sc on already finished body part and through the other side of sc. You have just made the arm and 4 fingers. pull your fingers around to form a hand and slip into the ch following the 2nd slip stitch made in the very first finger. Hide your tail into the palm of hand, for the tail near the body, wrap tail around the bottom part of arm and tie off, FO. Repeat for 2nd arm on opposite side of body. 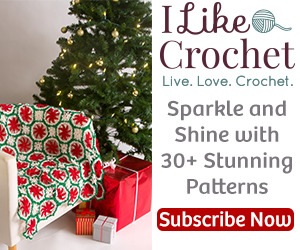 thank you so much for this pattern and video’s! they are so helpful. Very nice job, looks just like Olaf! Hello Colleen. I just finished crocheting your Olaf stuffy! You did really great with the instructions as well as the YouTube videos! Mine turned out almost exactly as good as yours! where are the directions for the mouth, teeth, arms and eyes? I think that you’re wonderful and so generous with sharing your Patterns. I am going to start your Pattern for a Christmas gift for my adopted daughter that is in love with Olaf, and she is in her 40’s, So you’re going to help me make a big score with her. LOL! So thank you so very much for being a great and wonderful person! Now to get busy so that it can be ready for Christmas. You’re a sweetheart! Thank you Sherri for your super sweet comment!